I was excited, but skeptical to review and test out this product. It is basically a clear gel top coat for your mascara. It claims it makes any mascara waterproof! Waterproof when you want it to be. 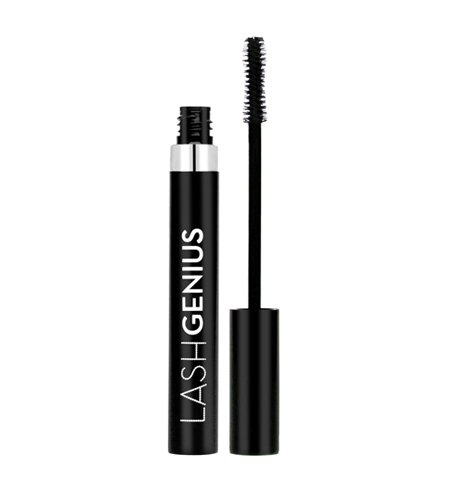 LASH GENIUS CLEAR WATERPROOF TOPCOAT instantly waterproofs, refreshes, and protects any mascara all day, without the typical drying or clumping. Its advanced, lightweight formula glides on smooth, dries quickly, and gives your lashes a touchably soft lacquer finish that lasts all day. Okay, but does it work? I splashed some water on my face, skincare commercial style! On one eye I had just a regular black mascara. On the other eye, I used the same mascara plus applied Lash Genius as a top coat. I waited a couple hours before this test. The left eye has the mascara and the Lash Genius. The right eye has just the mascara. You can see on the right eye that there is definitely more black underneath my eyes. As the water continued to drip down, underneath my eye on that side got much darker and I could actually see a black tear like trail down my face. I wasn't able to get a good picture to depict it though. But there was definitely a noticeable difference.